Depending on the print job, additional spot colors are either necessary or not needed. The task of preflighting is to determine whether the number and color channels names match the print job. If the preflight of the PDF indicates unwanted spot colors, remedy the problem through high quality spot color conversion in ZePrA, if the Spot Color module is licensed. If the Spot Color module is not licensed, convert spot colors using the alternate color space option in ZePrA. With this method, the results would be identical to conversion with a preflight program. Read more (link) about this in the chapter on Spot Color conversion for potential quality gains with the Spot Color module. After processing the job, check the spot colors in the PDF file by opening the Job Report for the processed file via the Job Properties menu entry. For fully automatic workflows in print shops without additional approval by the customer, ColorLogic recommends that only accepting CMYK PDF files from the customer that are tagged with correctly embedded profiles. If the files are not CMYK PDF files, ColorLogic recommends optimizing the data via ZePrA and proofing the converted files to the client. Note: standard queues Normalize and convert colors to new output condition created via the Auto Setup wizard with SmartLink function optimize all RGB, CMYK and Gray objects in a PDF file via DeviceLink profiles and give consideration to any embedded profiles during conversion. Alternatively, duplicate a standard queue and use it to change the way embedded profiles are handled (see next section). After successfully processing the job, inspect the profiles embedded in the PDF file in ZePrA by opening the Job Report for the processed file via the Show Job Properties menu entry. In some workflows, especially in printing companies, it is standard practice to remove the profiles in PDF files containing CMYK objects (images and vectors) that have embedded profiles. Primarily the premise is that the profiles were added incorrectly and would lead to problems in subsequent ICC conversion. 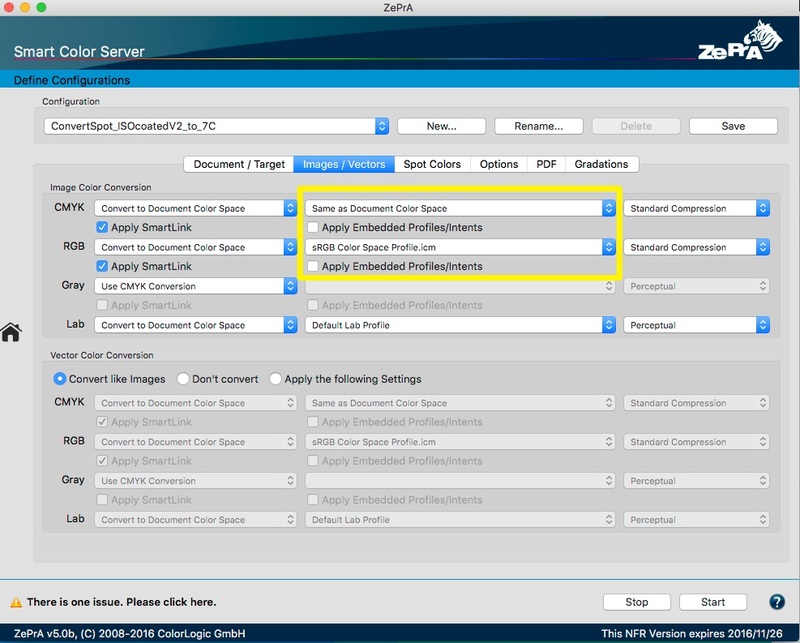 This procedure is the normal setting for Auto Setup queues in ZePrA if the SmartLink feature is not licensed. When the SmartLink feature is licensed, embedded profiles are considered. Negative outcomes are not expected with DeviceLink profile conversions that preserve the separations as well as the primary and secondary colors. 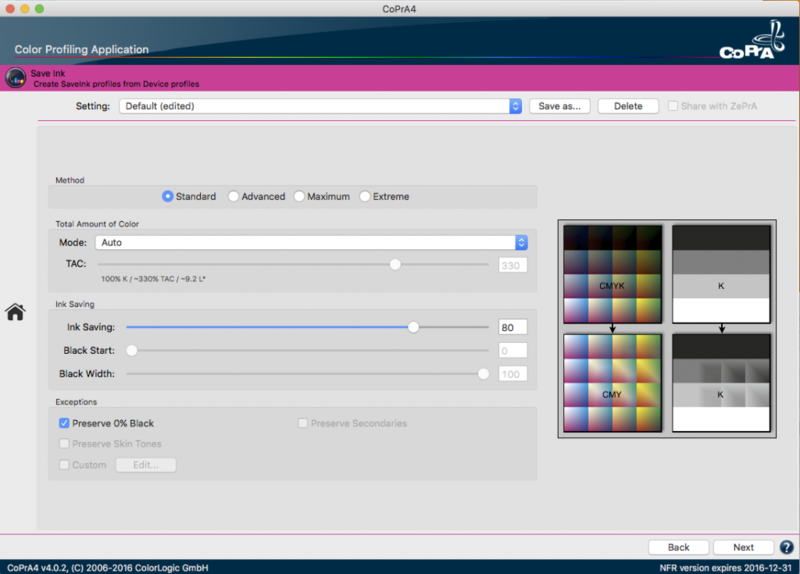 To change the option with an Auto Setup queue for normalizing and color conversion, SaveInk applications to ignore CMYK objects with embedded profiles or to disable the SmartLink function, please make the settings shown in the screenshot under CMYK in the Configurations/Images/Vectors tab. These settings ensure that no embedded CMYK profiles are used. When the setting is disabled the Same as Document color space is set and conversion performed using the profiles set in the Document Color Space tab. For printing companies it is important that the file specifications clearly indicate the maximum total amount of color expected for the type of paper to be printed and also the printing standard for which the client should ideally prepare the printing data. When printing on uncoated paper or newsprint, any marked issue of the maximum total amount of color is an indications that the image data was not optimized for the respective printing standard. This is typically a case of image data for coated paper for offset printing. Normalize and convert colors to new output condition: Conversion of the data from coated paper to uncoated newspaper, includes optimization of color appearance. Verify the results of optimization using a softproof. Checking for overprinting CMY objects without black is quite rare situation. To maximum color stability in the printing process with rapid drying and ink savings, we recommend ColorLogic SaveInk queues for all jobs, whenever possible. If the situation arises that an overprinting object in the PDF file is composed of all CMY colors without black, the resulting color from the overprinting object and the background may change following color optimization. The source of the problem lies method that the overprinting of CMYK on CMYK is handled in the PDF standard. Only when there is no color in a channel in an overprinting object can you completely “see” the color of the same channel in the underlying object. When there is a minimal amount of color in a channel in the overprinting object, only the color component of the upper (overprinting) object is displayed and put onto the paper. Since SaveInk replaces CMY components with black, the resulting output previously containing no black are composed with black, meaning that the overprinting properties may change. If this happens and you still want to apply SaveInk, calculate a SaveInk profile that preserves colors containing 0% black by enabling the setting Preserve 0% Black. This option is located in the SaveInk module in CoPrA.